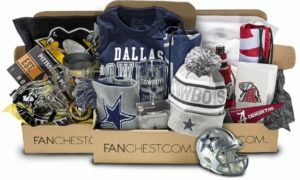 FANCHEST Sports Gift Box Giveaway – 18+, US ONLY – Ends 08/22 – Win! Win! Win! Warm welcomes to Eclectic Evelyn. This is our first event with her. She is the host of this giveaway and solely responsible for the prize. Win! Win! Win! is only helping promote this giveaway. Thanks for participating and good luck! Welcome to the FANCHEST Sports Gift Box Giveaway. FANCHEST is a Curated Gift Box of Officially Licensed Sports Gear. Created by fans for fans. Whether you are starting your college education or the parent of a college student, FANCHEST is a great way to show your team spirit. Show off what college your kids are attending with great team gear. Start your freshman year off right with official merchandise. Visit FANCHEST and pick your team! Makes a great gift for any sports fan in your life. 1 winner will receive a FANCHEST gift box from their choice of team. You can see what I received in my FANCHEST and read the review here. Please check out other contests listed at Win! Win! Win! Click here for Current Contests at Win! Win! Win! I would choose the cowboys! I would choose the NEW YORK RANGERS. I knew what team I wanted before visiting the site! I would choose the Green Bay Packers!!! I would choose the Clemson Tigers box! My hubby graduated from Clemson and we now have a little boy he can share his love for Clemson football with! I would pick New England Patriots. I’m a cheesehead, so of course THE PACKERS! I would pick the Denver Broncos.